When Porsche returns to the 24 Hours of Le Mans in search of its 17th overall victory in 2014 the famed German sports car maker could rely on hybrid power to do so admits motorsports boss Hartmut Kristen. Commenting in a release issued by Porsche on its return to the top-tier of sports car racing and the future of the program, Kristen said that, “the integration of our hybrid technology in the vehicle concept is one possible option.” Kristen is cautions, however, admitting that the entire plan would rely on exactly what the rules allow, but you can be certain Porsche is already lobbying the sport’s governing body. Currently the LMP1 class is dominated by Audi’s R18 diesel race cars, with the only serious rivals coming from Peugeot with diesel technology as well. The reason for their success is fuel economy, with the diesels taking fewer pit stops to refuel. Porsche has already proven with its GT3 R Hybrid race car that it can achieve similar success using hybrid technology, taking the overall win in round four of the Nürburgring Long Distance Championship by requiring one fewer pit stop than the rest of the field. the GT3 R Hybrid uses a modified version of the original GT3 R hybrid powertrain, making 470-hp from a naturally aspirated six-cylinder boxer engine, with an additional 200-hp of electric boost available on demand. 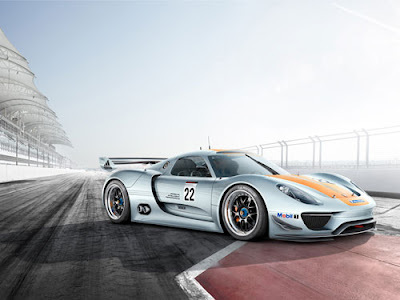 Baring a miracle breakthrough in internal combustion engine technology between now and 2014, look for Porsche to take to the the LMP1 class with a hybrid race car. Perhaps the bigger question would then be who Porsche will compete against. While Audi is the dominant force in the series right now it’s unlikely the two will square off on the track, considering they are both owned by Volkswagen. Does Porsche’s LMP1 success depend on the end of the Audi program?